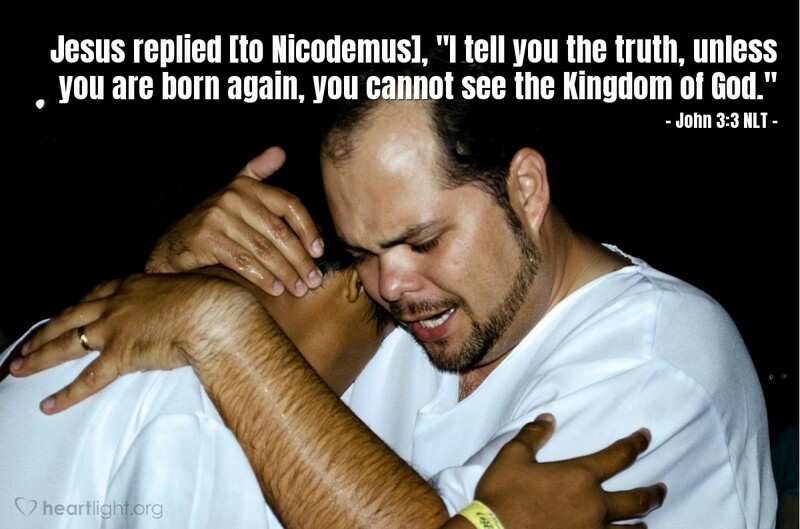 Jesus replied [to Nicodemus], "I tell you the truth, unless you are born again, you cannot see the Kingdom of God." Jesus basically tells Nicodemus, a religious ruler and a righteous man, that he must start over. Not only that, he tells him he must have a fresh start that only God can bring about. He must be reborn. That is no longer a theological discussion, but a personal one: "... unless YOU are born again, ..." But more than just being born again, Jesus is telling Nicodemus that he must be "born from above" (John 3:3 NRSV) or "born of water and Spirit" (John 3:5). (This spiritual birth is essentially what John emphasized in his gospel when he talked about being "born of God" in John 1:11-13 NIV.) Another human birth, another birth by human efforts and origins, isn't possible but more importantly, it simply couldn't accomplish what is necessary for Nicodemus or anyone else to be a part of God's Kingdom. Getting ourselves into God's Kingdom is something that even the best of the best can't accomplish for himself or herself. Good won't cut it. Only God can make this birth happen. Can we hear that? Oh yes, because in our heart of hearts, we all know we don't measure up. Deep down, we know that only God's grace and the power of the Holy Spirit can make us God's holy children. Father, thank you for not only providing Jesus' sacrifice for my sins but for also providing the rebirth that makes me your holy child. By grace and in the name of Jesus, I pray. Amen.